Sales: Alabama statewide home sales totaled 4,222 units during February, up 10.9 percent from 3,807 sales in the same month a year earlier. February sales were up 25.7 percent compared to 3,358 sales in January. Results were 23.9 percent above the five-year February average of 3,409 sales. Two more resources to review: Quarterly Report and Annual Report. Inventory: Homes listed for sale statewide during February totaled 21,051 units, a decrease of 8.9 percent from February 2018’s 23,106 units, and a decrease of 4.4 percent from January 2019’s 22,029 units. February months of supply totaled 5 months, a decrease of 17.8 percent from February 2018’s 6.1 months of supply. February’s months of supply also decreased from January’s 6.6 months of supply. Pricing: The statewide median sales price in February was $157,319, an increase of 3 percent from one year ago and an increase of 4.2 percent from the prior month. This direction is consistent with historical data (2014-18) indicating that the February median sales price on average increases from January by 0.6 percent. The homes selling in February spent an average of 99 days on the market (DOM), a decrease of 21.8 percent from 126 days in February 2018 and a 7.4 percent decrease from 106 days in January. This indicator can fluctuate from month to month because of the sampling size of data and seasonal buying patterns. Forecast: February sales were 184 units, or 4.6 percent, above the Alabama Center for Real Estate’s (ACRE) monthly forecast. ACRE projected 4,038 sales for the month, while actual sales were 4,222 units. 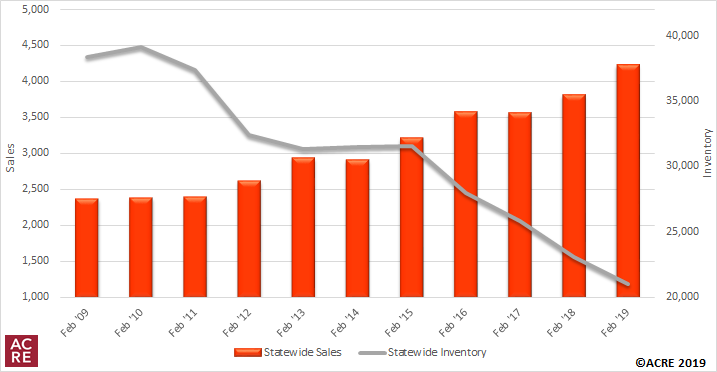 ACRE forecast a total of 7,576 residential sales year-to-date in 2019, while there were 7,580 actual sales through February, a difference of less than 0.1 percent.